Traveling from Leh to Nubra Valley has got to be one of the roughest road trips I've ever taken. Riding on the Toyota Innova that we hired for this trip felt like riding on a rickety train. 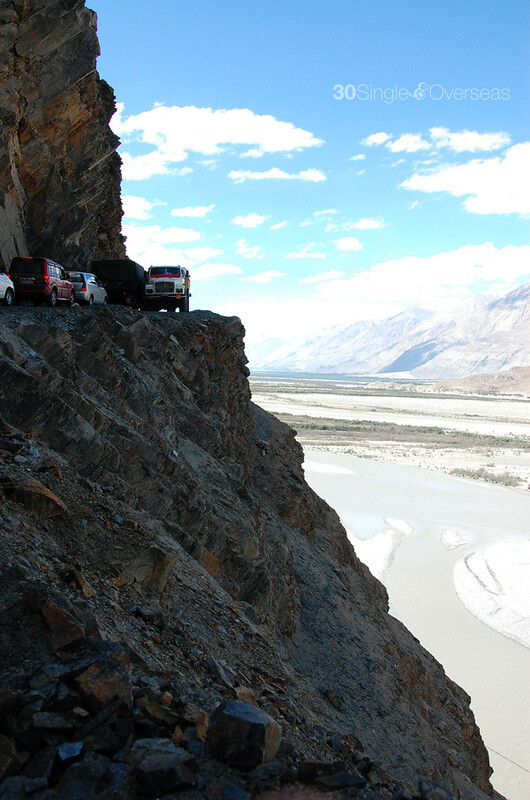 Roads slips and slides for a couple of hours until you reach Nubra Valley. We want to see you drive through this, Top Gear! Khardungla is en route to Nubra. 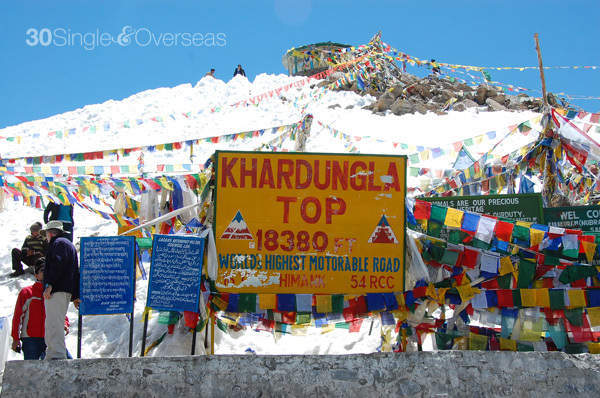 At 18,380 ft above sea level, it is the highest motorable road in the world. We were told not to stay here for more than a few minutes or we might start feeling altitude sickness. We, of course, didn't listen. It's hard not to hangout since it's one of the few places in the world where you'd get birds view of the Himalaya. It was simply spectacular. We met some people who drove all the way from Leh to here and turned back because the roads were flooded from melting mountaintop snow. 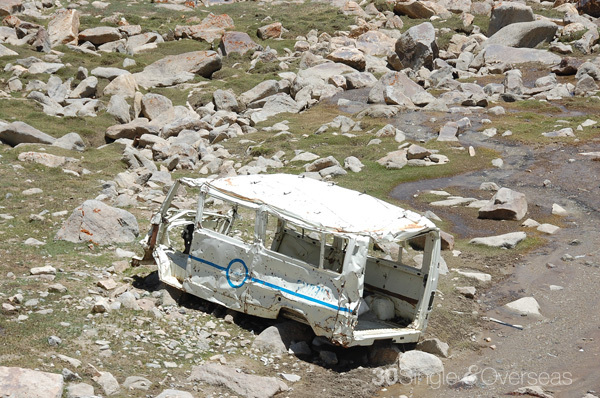 Traveling in Ladakh is really based on luck. The road to Hunder, Nubra Valley has the most amazing views but also the most dangerous - definitely not for the fainthearted. 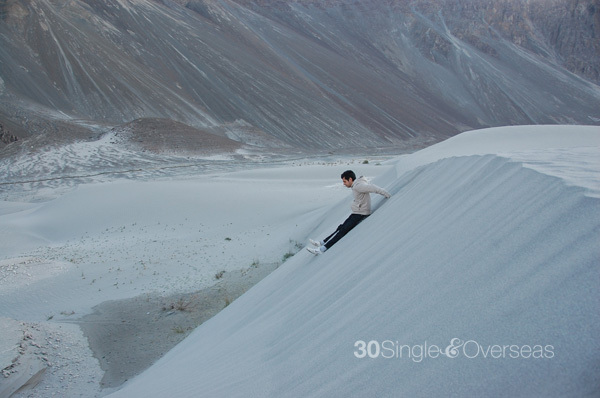 Rolling sand dunes of Hunder, Nubra Valley. 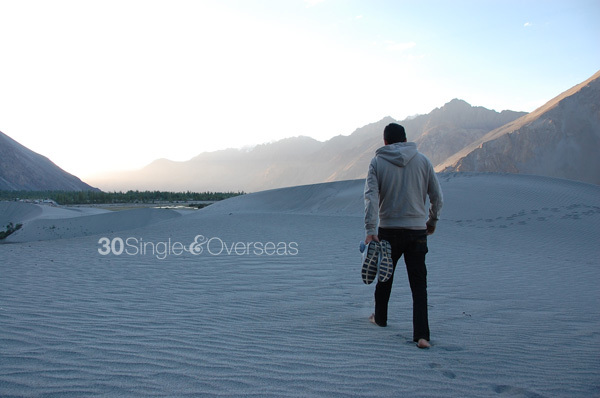 This is as far as foreigners can travel and till this day, as close as I have gotten to Pakistan. Bactrian camels left behind from Silk Route days. These bactrian camels and the people who run the rides have a pretty good deal going. Every evening at 6 p.m., the camel walas (camel managers?) will feed the camels some atta (wheat dough) as a form of "payment" and then release them back into the forest. We noticed at exactly 6 p.m, the camels would start becoming antsy, which reminded me of office people who were ready to punch-out. The next morning, the camel walas will go into the forest and gather the camels again for "work". 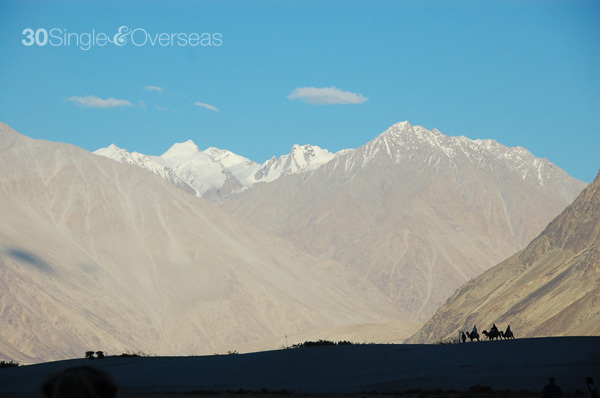 Nubra Valley at almost sunset. There are no hotels or resorts here, only campsites. We stayed in one that was run by a monastery. 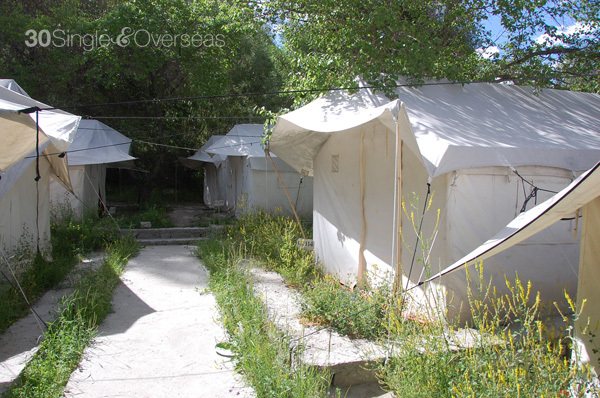 These camps were pitched next to this 300 year old palace that used to belong to the Nubra royalties. Inside the 300 year old ruined palace. 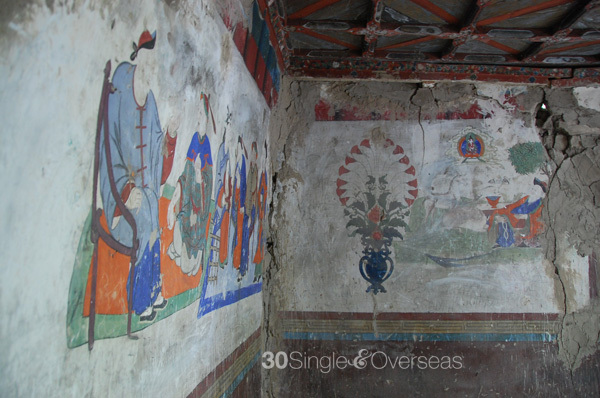 These paintings have not been restored. "A": This is the ultimate sandbox! Warning: Do not play in the sand if you have electronics (cameras, iPhones, etc) in your pockets because you might destroy them. Foreigners are only allowed to stay up to seven days. 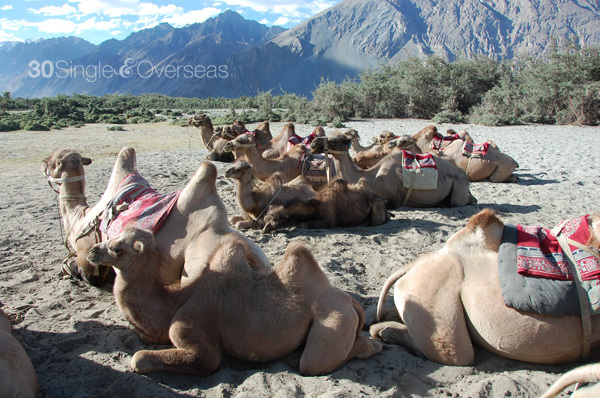 I don't need seven days but if I ever come to Nubra Valley again, I'll definitely plan for more than one. 2 - There are no proper recycling facilities so take your trash (plastic bottles, wrappers, etc) with you when you leave. 3 - Pack appropriately - it's fairly warm down in the valley but the stop at Khardungla can be chilly. 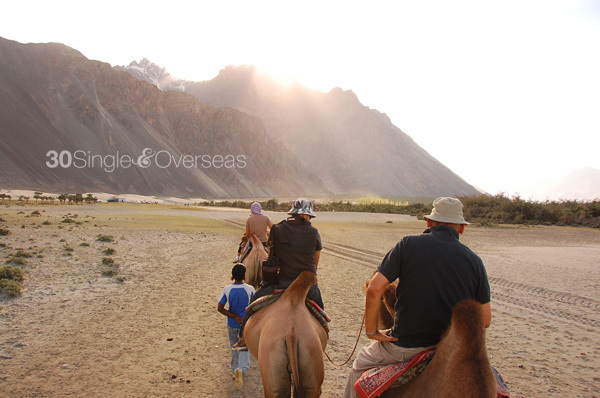 Click here for more pictures of Nubra Valley. Thanks Apurva! I had a great time and it's one in a lifetime experience!